Flat-panel TVs with 30 channels of HD programming. Easy-access Plug-and-Play feature makes it simple to connect electronics. The La Quinta Inn San Antonio Toepperwein is north of downtown San Antonio, only minutes from San Antonio International Airport and Randolph Air Force Base. From this hotel, you can easily reach all area attractions including Retama Park Race Track, Brackenridge Park and Zoo, Schlitterbahn, Verizon Amphitheater, The Alamo, San Antonio Riverwalk, SeaWorld San Antonio, Six Flags, and Splashtown. Here for the shopping? There's Rolling Oaks Mall, Forum Shopping Center, and the San Marcos Outlet Stores. 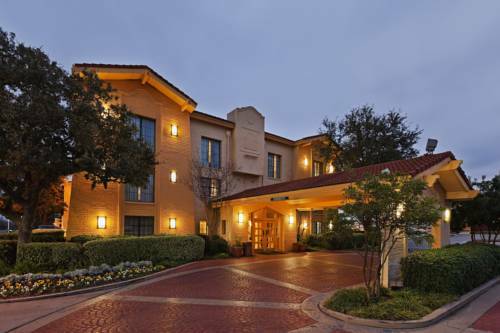 The La Quinta Inn San Antonio Toepperwein has sizeable meeting facilities for up to 60 people, and a courteous staff to ensure an enjoyable visit. We serve a free Bright Side Breakfast each morning. All of our spacious well-appointed rooms come with free high-speed Internet access, a coffee maker, iron/board, hair dryer, and other useful amenities. The property also has a refreshing swimming pool for your enjoyment. Easy access from Interstate 35, near Northeast Methodist Hospital.